Getting ready to dive in to your digital journey? Are terms like digital transformation, digital business, modernizing infrastructure, scalable infrastructure, optimizing IT, and modern development starting to resonate with you? These and many more topics related to hybrid cloud solutions are on stage (virtually) this week, keynote speakers, sessions and more. Everything is brought to you live sessions and as post-event recordings on-demand that you only need to register for to attend and view (recordings available through late September). Red Hat Cloud Suite is the baseline for these sessions, bringing together Ops, DevOps and modern AppDev storylines in a single event. 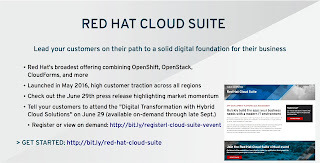 This is Red Hat's broadest offering combining OpenShift Container Platform, Red Hat OpenStack Platform, Red Hat CloudForms, and much more. Scale and optimize existing infrastructure. Modernize application development and operations. Ensure success with Red Hat services and partners. This event will also explore how a container management platform, massively scalable infrastructure, and hybrid cloud management, available through Red Hat® Cloud Suite, can act in concert to accelerate your digital transformation journey. You'll hear about market trends and dynamics in the opening keynotes, and then will be able select from a full library of breakout sessions that interest you most.